You can't predict what they'll get into out there, but you can in here. 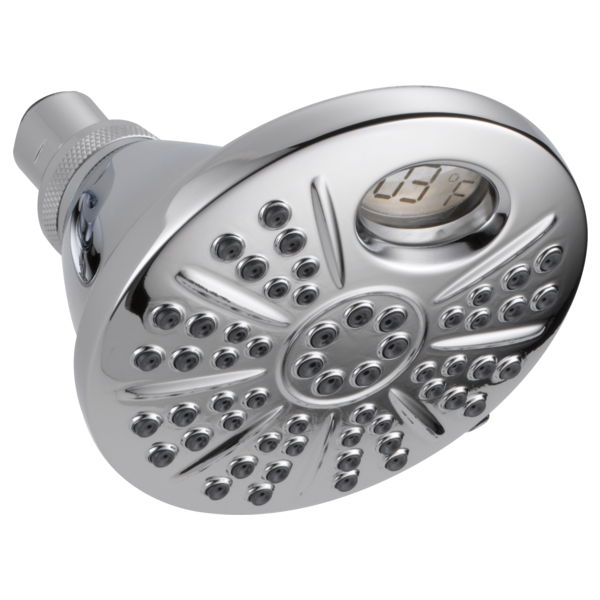 Delta Temp2O Technology uses a digital display to show the temperature of the water flowing from your Delta shower head, hand shower, or tub spout accompanied by a color indicator to make it easy to tell at a glance when the water is right for you and safe for your family. The LED display will be blue when the temperature of the water is below 80°F (26.7°C), shows deepening shades of magenta as the temperature rises from 80°F (26.7°C) to approximately 110°F (43.3°C) and will turn red when the temperature is higher than 110°F (43.3°C), helping you avoid hot or cold surprises. 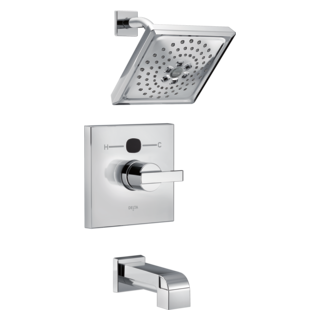 Click below to browse products featuring Temp2O Technology. 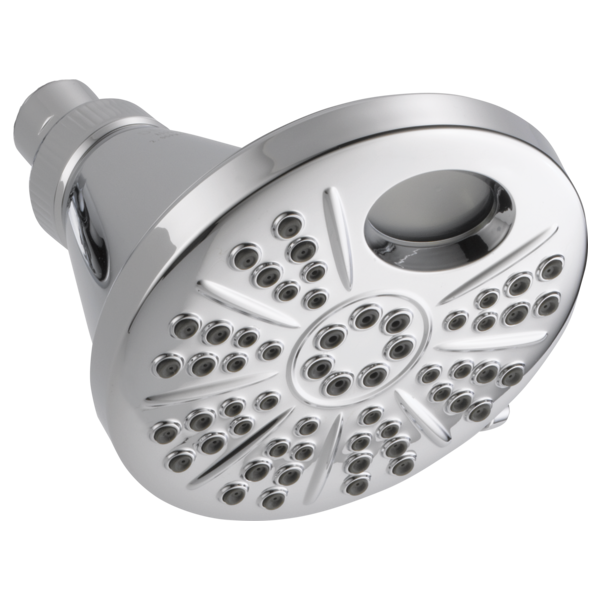 My grandchildren love this shower head. They no longer need grandma or grandpa to check the water temperature before they get in. They just check the display and get in when it reaches the appropriate temperature. I am going to buy the hand shower next so they can use it in the bath tub. What a great concept. Thank you Delta! This product is not only amazing for any adult, but it makes bathing a baby or child a million times easier. 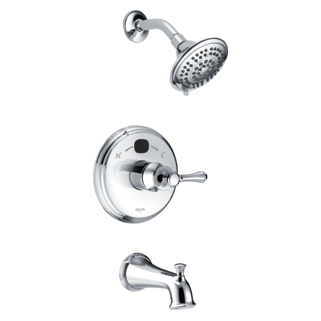 Plus, it makes your shower look instantly classier. This is definitely a must buy product!!! This product is great for families! The Delta Temp2O 6 Setting Shower Head has a very cool feature that takes the guess-work out of shower water temperature. An LED digital temperature display lets you know the exact temperature of the water. What’s even better is that the various temperature ranges are also color-coded. So, as soon as you turn on the shower, you’ll most likely see the display in blue with a temperature reading. As soon as you start turning it up a notch, you’ll see the temperature rise digit by digit. You’ll also see the display change to a magenta color. This is usually the zone we’re in when my kids are in the shower. For us, this water is in the 80-90 degree range. If you really want to turn up the heat…literally…you’ll see the display turn to red. This water is extremely warm (over 100 degrees) and is probably not what you want to have for your child or for yourself for that matter. The great thing about this is if you or your child accidentally turns the temperature knob too much, the red display immediately lets you know the water is at one of its highest temperatures without anyone getting hurt by touching the water. The unit is nice and easy to use. The temperature gauge is a wonderful idea to the unit. I like it! One thing I don’t like that the handle does not set in the seat very well. It did fall a few times. So now I’m careful how to insert it back into the seat. 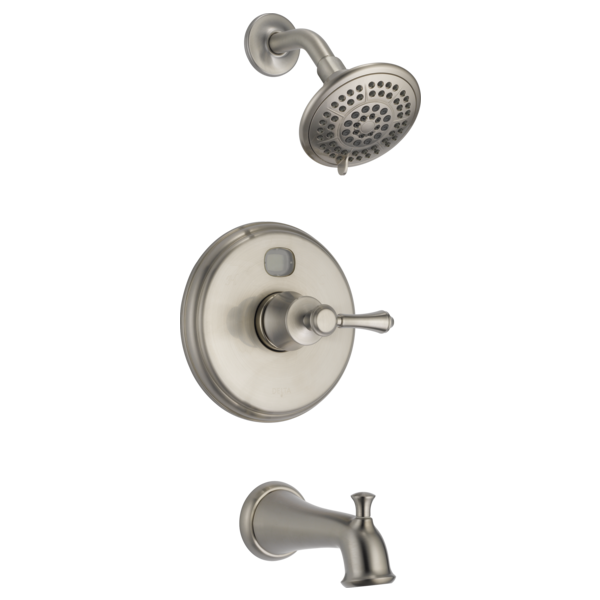 Maintains the water temperature when another facet is turned on! Looks good. My only complaint is that the faceplate is plastic. At what temperature does the shower head or tub faucet display change color? Blue represents below 80 degrees, magenta is between 80 and 110, red is greater than 110 degrees. 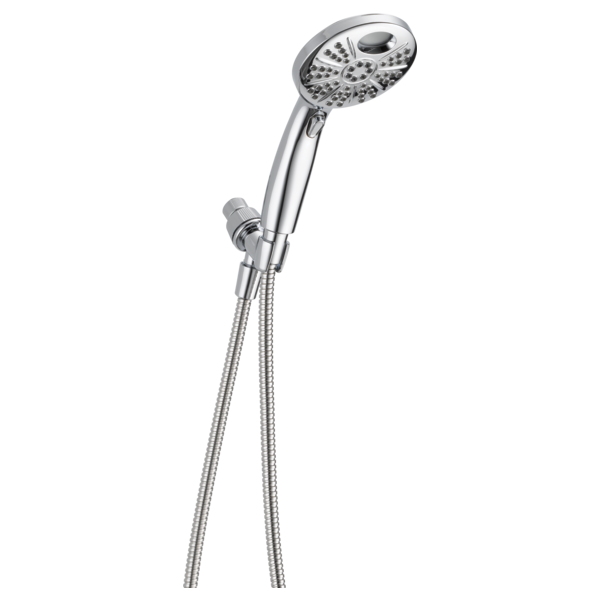 Does the Delta Temp2O shower head or tub faucet require batteries? 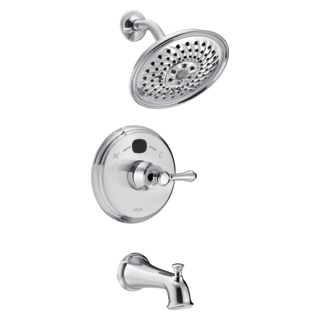 Shower Head and Tub Faucet do not require batteries; they are all water powered! What water temperature should I bathe my children at?